14:22 (12:22) A protester holds up a shot phone as proof that firearms are being used. 14:23(12:23) Support in the Olympic village. 14:25 (12:25) Medvedev asked Yanukovich to grow a spine. 14:28 (12:28) Gas stations in Brovarsky district have already closed. 14:33 (12:33) Aftermath of a sniper. 14:35 (12:35) The flight of Tsarev (vice head of the Region Party, advisor to the Premier Minister of Ukraine, member of the Political Council of the Region Party) is on its way to Moscow, you can follow it here. 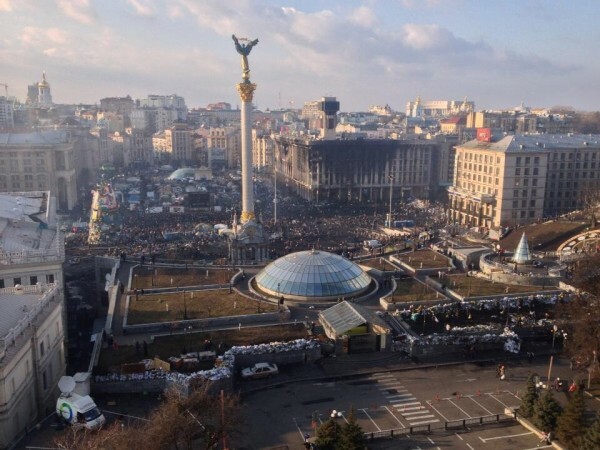 14:36 (12:36) Maidan right now. 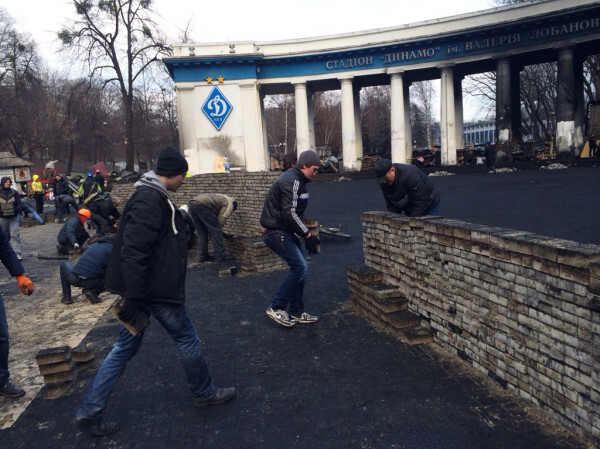 14:43 (12:43) The Barricade at the Institutskaya Street has been restored. 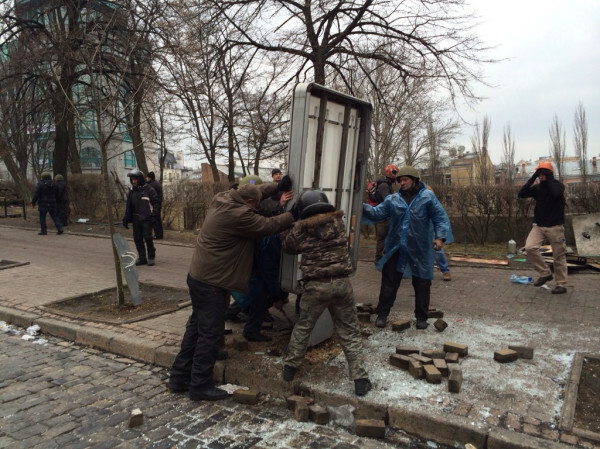 14:50 (12:50) Protesters are tearing up a street sign. 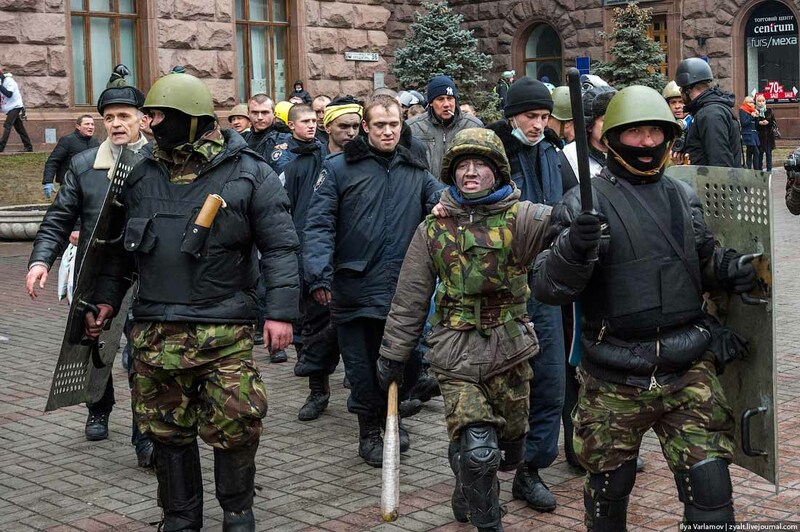 14:54 (12:54) The rumor around Maidan is that in the city of Uzhgorod, the Berkut forces have joined up with the people. 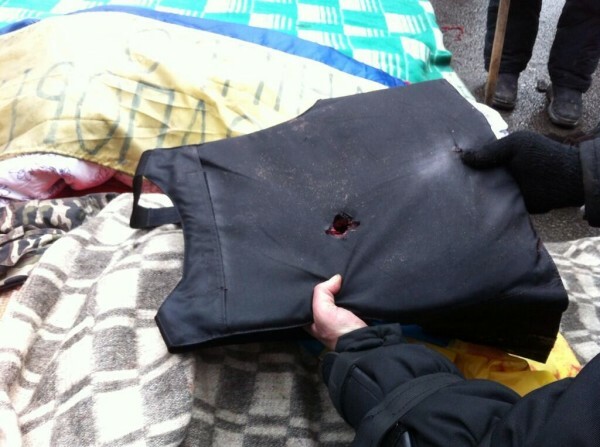 14:55 (12:55) There are about ten casualties as of now in the lobby of hotel Ukraine. 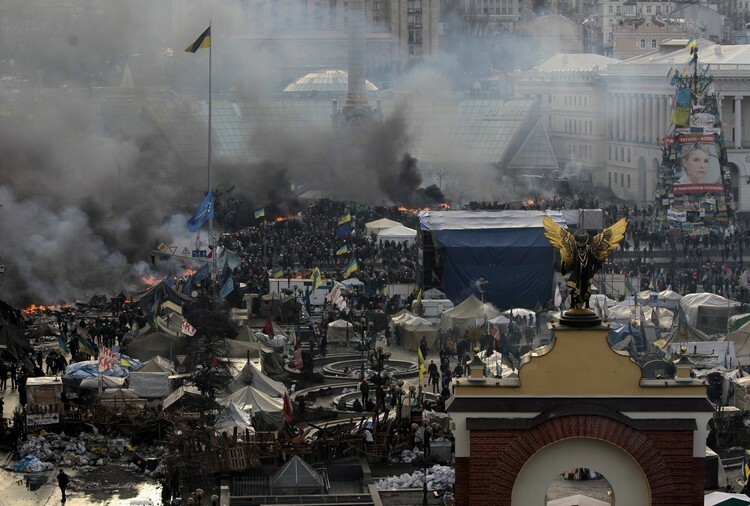 14:57 (12:57) Klichko: “Verkhovnaya Rada will meet urgently at 3PM to decide on the resolution of this crisis. 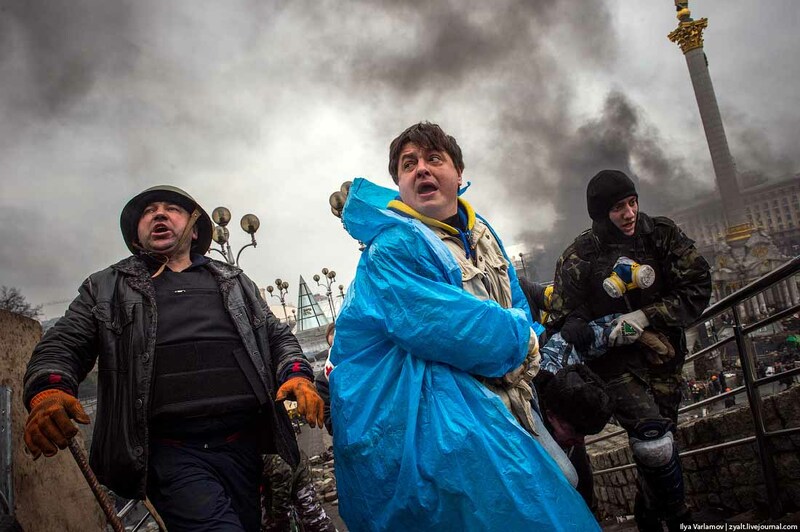 President Yanukovich must agree to an early election. 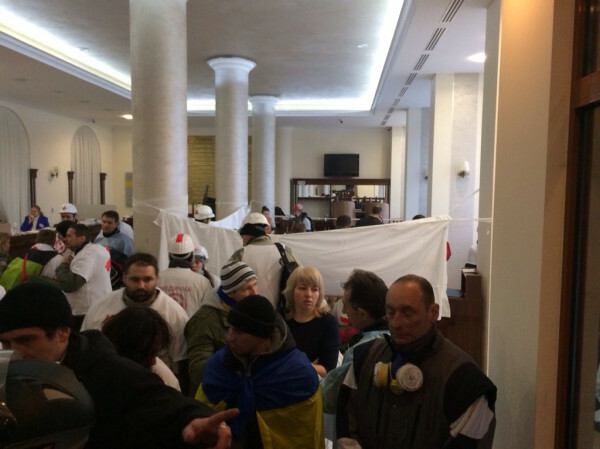 14:59 (12:59) The lobby of hotel Ukraine is now a clinic. Surgeries are underway. Many corpses. 15:11 (13:11) Chairman of the City Administration has announced that he is leaving the Region Party. 15:13 (13:13) Vice Premier of Russian Federation, Dmitry Rogozin canceled his Kiev Visit. 15:16 (13:16) Medics: 13 protestors killed by single sniper shots. 15:18 (13:18) Some are calling to avoid the barricades due to the snipers. 15:20 (13:20) At 3:00PM, Moscow Time, there are a total of 505 victims, 292 are hospitalized. 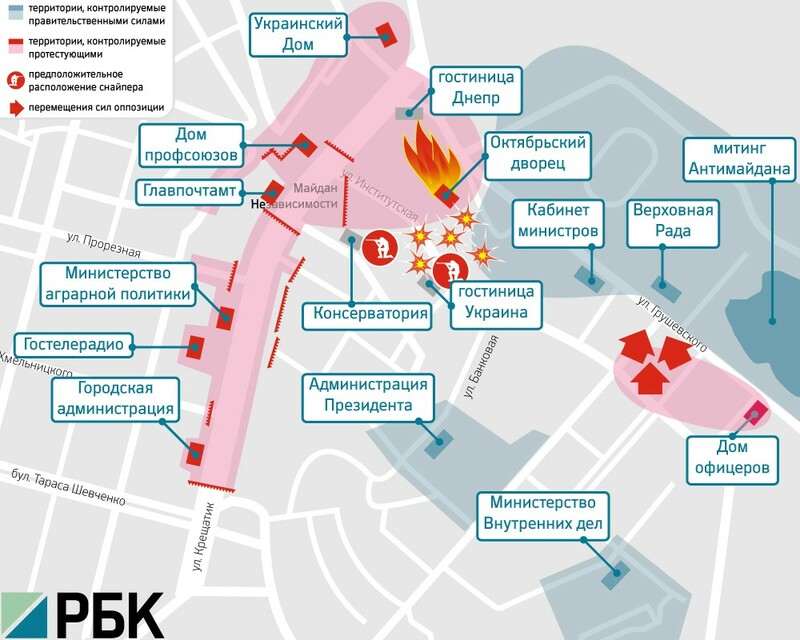 15:26 (13:26) Plan of the battle in Kiev. 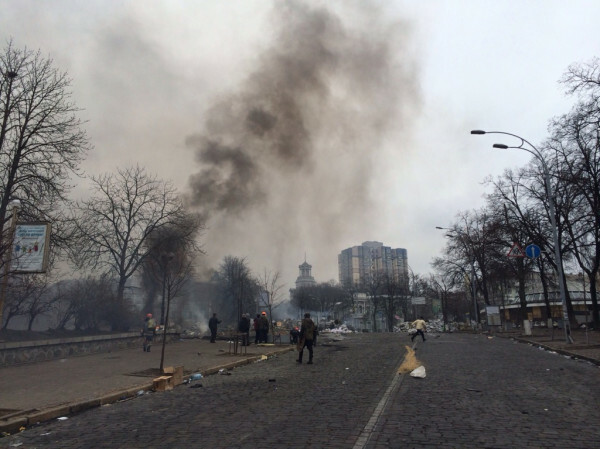 15:29 (13:29) RBK: Dozens of national guard soldiers have surrendered to the “Defense of Maidan” on the Grushevskaya Street. 15:30 (13:30) Main bridges across Dnepr River are blocked. There are traffic jams in the outskirts of Kiev as a result of the huge lines at the gas stations. 15:34 (13:34) USA has enacted visa sanctions against the government officials of Ukraine. 15:35 (13:35) All bridges to the left bank are being closed. 15:36 (13:36) At the Podol neighborhood, seven hundred Titushki head to the center of the city. 15:38 (13:38) Investbank of EU is leaving Ukraine. 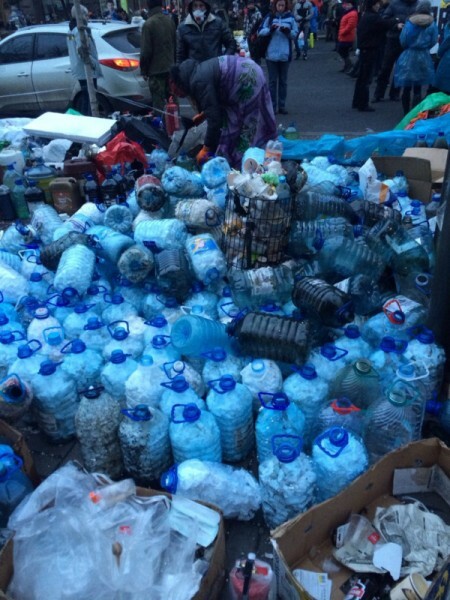 15:44 (13:44) A field hospital is set up on Kreshatik Street. 15:48 (13:48) The activists are trying to block Boris Polsky highway, to stop the security forces. 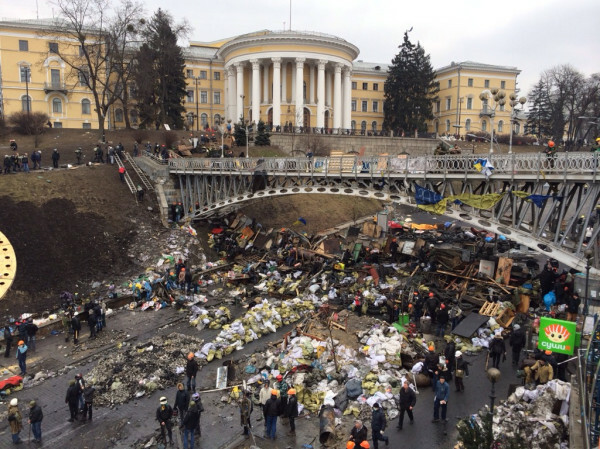 15:55 (13:55) A field hospital is organized in the hotel Ukraine. So far fifteen people have died. Six more will likely day in the next few hours. Most are admitted with bullet wounds. 16:11 (14:11) Sale of tickets out of Kiev to the west is stopped. 16:14 (14:14) Mayor of Kiev’s address to Yanukovich. 16:15 (14:15) Six more members of the Region Party declared their exit – Ivan Bushko, Mikhail Lano, Vasily Kovach, Sergei Moshak and Ishtvan Gaidosh. 16:16 (14:16) Ministry of Regional Development is evacuating members of the ministry out of their building at the Bolshaya Zhitomirovskaya street. 16:22 (14:22) There is an incredible amount of people in supermarkets. Everyone is stocking up in case of state of emergency. 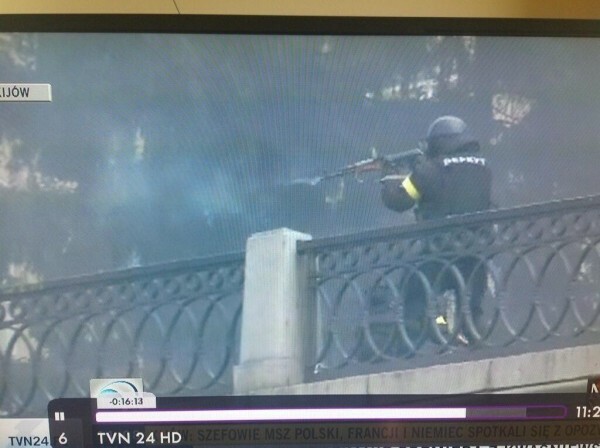 16:23 (14:23) Shooting of the protestors, today in Kiev. 16:48 (14:48) Cold cuts reserves. 16:48 (14:48) People are bringing food to the St. Michael's Cathedral. 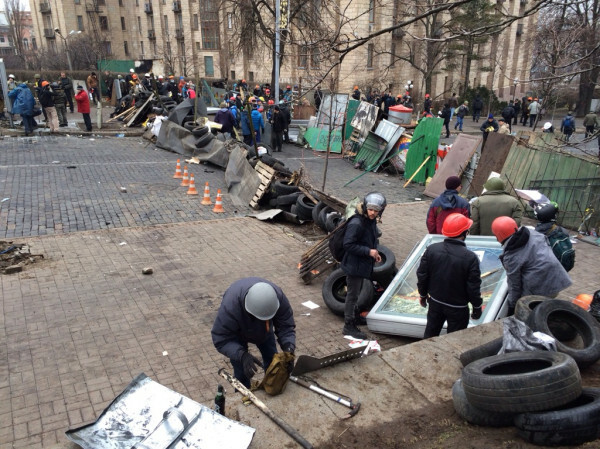 This is the rear base of Maidan. 16:56 (14:56) Verkhovnaya Rada security and police are trying to prevent journalists from attending the parliament session. 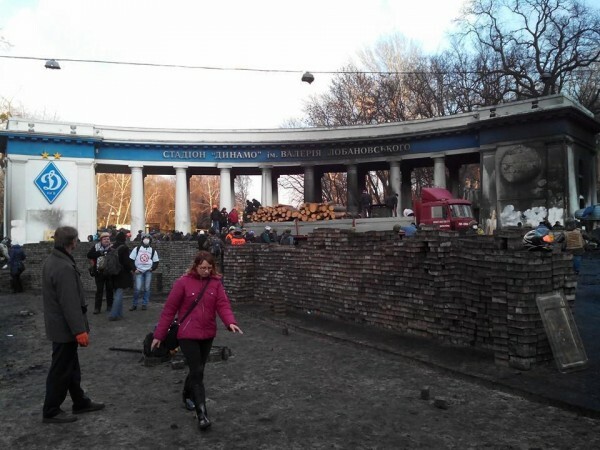 17:06 (15:06) A wall being built on Grushevskogo Street. 17:10 (15:10) Lukashenko(President of Belarus) sent his sympathies to Yanukovich. 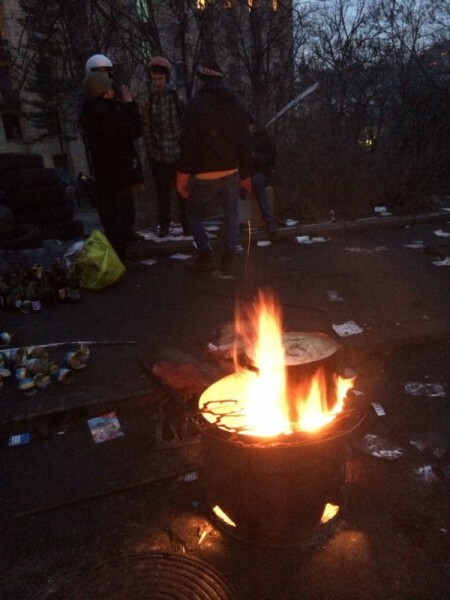 17:26 (15:26) People living in the center of Kiev are leaving their homes. 17:39 (15:39) Trains moving in the west directions are back on track. 17:43 (15:43) "Transaero" and "Aeroflot" airline companies limited the sale of plane tickets sale in Ukraine. 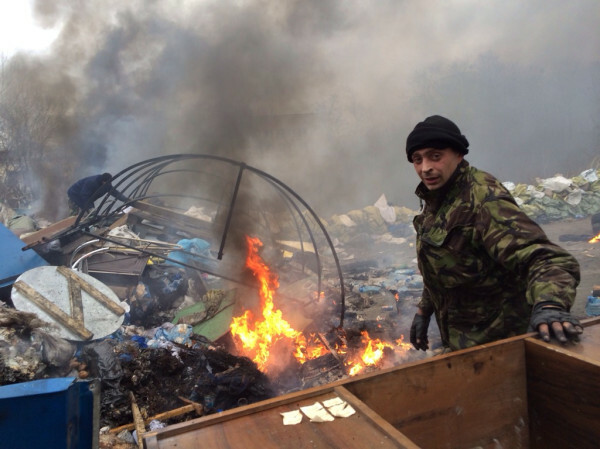 18:02 (16:02) The head of the Ukrainian National Police Service Vitaliy Zakharchenko was ordered to supply the police with fire arms. 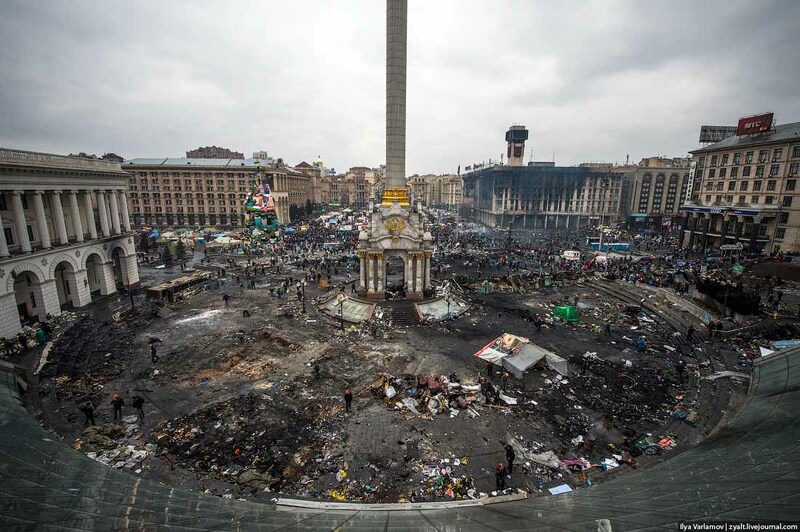 Here is how Maidan looks like right now. 18:30 (16:30) 60 people were reported to have been killed today. 18:50 (16:50) 100 people were killed (according to medic reports). 18:59 (16:59) The Ministers of International Affairs left the meeting with Yanukovych with grim faces and drove away without saying a word to journalists. 19:11 (17:11) Snipers on the Institutskaya street continue shooting. Several more citizens were injured. 19:18 (17:18) The head of Ministry of International Affairs of Russia "Western mass media present the information about the events in Ukraine in a rather twisted way"
19:23 (17:23) That's fucked up. An old man was almost shot. 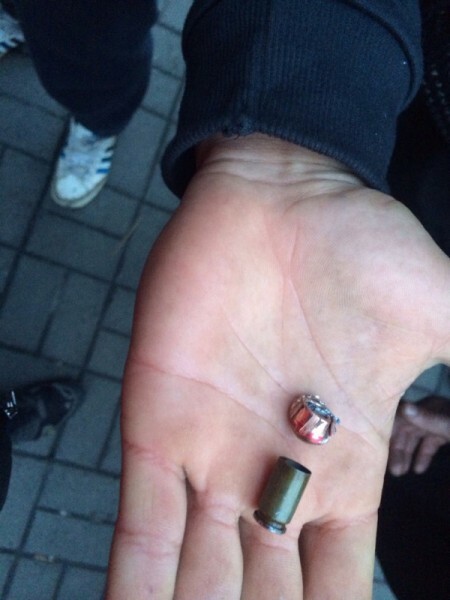 An old man was almost shot by a pro-government activist. The shot missed and the shooter ran away. 19:29 (17:29) The station for filling plastic bottles with bits of foamed plastic. 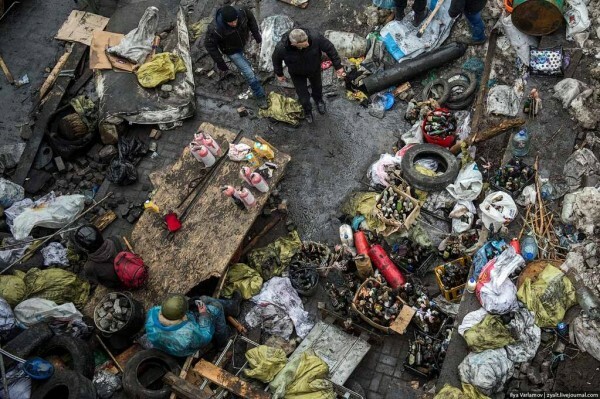 20:05 (20:05) The Coordinator of the medical service department reports: 70 to 100 people were killed on Thursday. 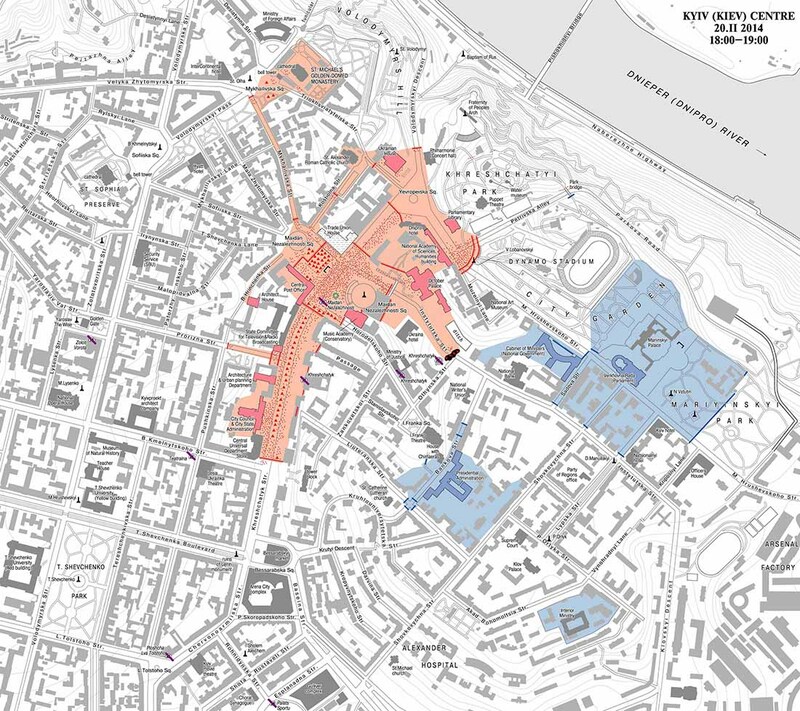 20:21 (20:21) Berkut and the police of Uzhgorod have come to take the people's side. 20:28 (20:28) "The only reason for our military men to apply physical force and weapons is to stop extremist and illegal actions of radical forces in order to preserve peace amongst pacific citizens, to provide stability of the state and to prevent Civil war in Ukraine" claims the Ministry of Defense. 22:00 (20:00) Waiting for Rada's decision to be made. For now all the barricades are being fortified, tires are being delivered. Rumor has it that officials are leaving the country. 22:30 (20:30) We now have a list of 58 people killed. 23:00 (21:00) BRKN! Victor Yanukovych is ready to hold early elections this year, says the Prime Minister of Poland. 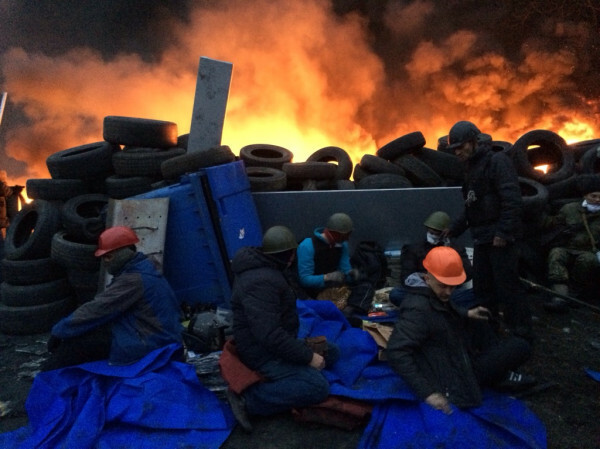 23:09 (21:09) A crowd of 5 thousand people has blocked the access to Boryspil, Kiev airport. The people intend to not let the officials flee from the country. 23:13 (21:13) Vladimir Rybak (Deputy of Verkhovna Rada - Supreme Council of Ukraine) has fled from the country via Zhuliany airport, International airport of Kiev. 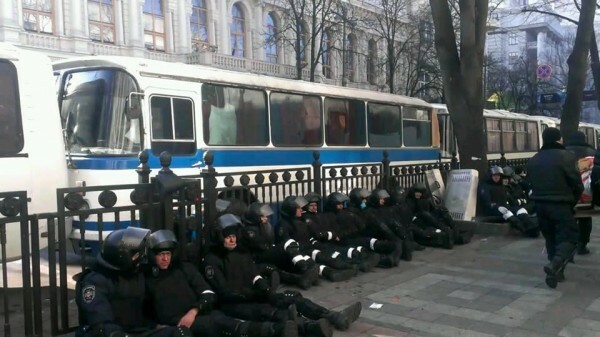 01:00 (23:00) Verkhovna Rada has left to take some rest until 10 am tomorrow morning. LIVE reports are finished for tonight. We will continue tomorrow at 12pm Moscow time or 10am Kiev time! может для отчета перед госдепом стоит завести другой журнал? С утра из американского посольства выпустили трёх снайперов. Они передвигаются по крышам домов в Киеве и убивают сотрудников милиции и майдановцев. Прямо сейчас мобильные группы СБУ проводят операцию по поиску этих уродов. Не там ищете, в соседней палате гляньте. "Гpаждане, называющие себя иностpанными pезидентами, действительно попали к нам не по адpесу. И были пеpепpавлены нами тут же в соответствующее заведение, где тепеpь и пpебывают в полном соответствии в одном номеpе с Hаполеоном, Александpом Македонским и астpонавтом с Альфа-Центавpа, котоpый пpилетел к нам на летающей таpелке, чтобы купить пленки с записями песен Михайлова". Чё? Пеши по русски, ёбто, тут иностранцев нет! Пневматикой в старый телефон, круто, чо? Я так штук пять телефонов разбил. 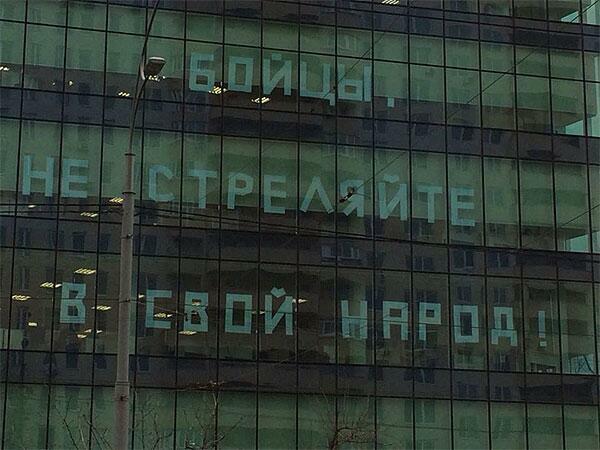 В серединку прям попали. И не жалко выкинуть потом. а вы, за красных или белых? WAS IST LOS( zyalt) ? чет пленные беркутовцы шибко похоже на самих ряженных майдановцев. Но сделайте его до конца хорошо - переводите видео на Vimeo или что-то похожее. На Youtube "майдановские" видео банально банят для "цивилизованных". фото с телефоном фейк и постановка. видны следы газов, значит стреляли отдельно в сам телефон с близкого расстояния. какие нафиг газы в духовушке?